Cardiff City’s first match in the Premier League ended in disappointment as West Ham cruised to a 2-0 win at Upton Park. Joe Cole fired a sweet low finish past David Marshall after turning beautifully on a Matt Jarvis cut-back 13 minutes in. Kevin Nolan put the result beyond doubt with a curling effort with a quarter of an hour left as Cardiff – returning to the top division for the first time since 1962 – disappointed. Mark Noble got the assist for that goal. The hosts dominated for large swathes of the match, despite mostly playing long ball. Cardiff, for their part, showed little of the form that saw them win the Championship last season, although they had to do without new striker Andreas Cornelius, who missed out with an ankle injury. The Hammers were also missing £15m man Andy Carroll, signed permanently after the previous campaign’s loan, sidelined with a heel problem. 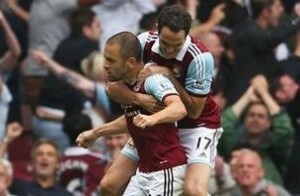 Joe Cole and Kevin Nolan are on target for West Ham as they open their new Premiership campaign with a 2-0 win over new boys Cardiff City.